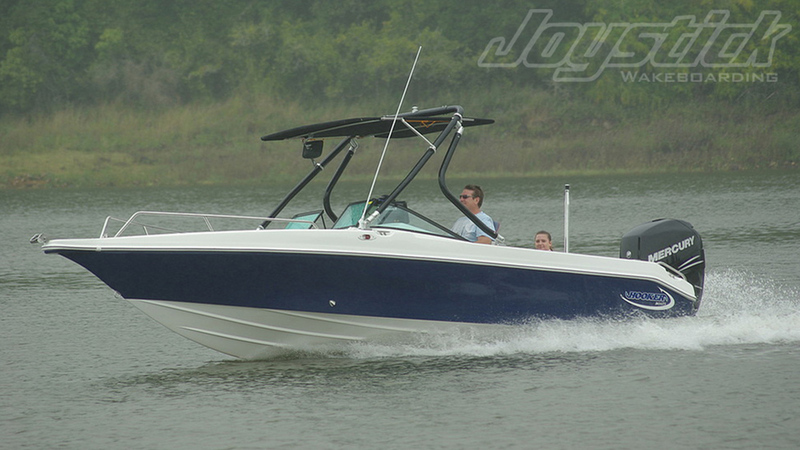 The Joystick Pro-Series Wakeboard Tower is a great addition to any boat. This is great looking Tower which will deliver pro performance, taking any rider to the next level. The swept back sleek style looks great on any boat. The Pro-Series Tower can be removed of folded down flat in just a few minutes. Universal to fit almost every boat. The Tower is made with super stout 2.5 inch diameter, 6061 aircraft tubing that will handle and size rider. The tubing is bent in house on our mandrel bender which eliminates wrinkle, distortion and fatigue. The Towers are sand blasted then powder-coated to give a durable and great looking finish. All of the hardware is CNC machined in house then finished with a clear anodize to prevent oxidation and to keep them looking great. The mounts will work on the top or the side of the boat. Backing plates and rubber gaskets are included. Colors: black, white, silver, red, navy blue, forest green, yellow, burgundy, and dark gray. We also do custom colors. The Pro Series Tower is built to last and that is why we can offer a "life of the boat" warranty, as long as you own the boat. If you send us the make, model, and year of your boat we will send pics on it, if we have them.